Water conservation has a great number of benefits. First, it decreases the energy and resources being consumed by purification and transportation methods. Second, since overloaded systems can create back-flow into natural habitats, conserving water can lessen pollution to nearby lakes, rivers, and reservoirs. And of course, there’s always the added perk of lower monthly bills! 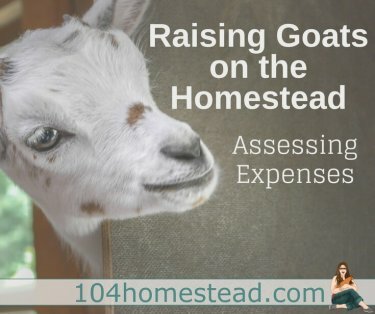 The homestead is ripe for opportunities to save water. Here are a just a few to get you started! Cleaning the fish tank isn’t the most enjoyable of tasks. However, you can find joy by using the nutrient-rich wastewater to moisten your non-edible plants. Instead of running water from the tap, wash your fruits and vegetables in a pan of water. Use the leftover water on your houseplants! Place a bucket in the shower or tub to catch running water as you wait for it to heat up. Use it to water the garden. Drain pasta water into a large pot. Once it cools, you can use it to water your plants. Use a rain barrel to harvest rainwater from gutters to water your garden. For each inch of rain that falls on 500 square feet of roof, you can collect 300 gallons of water — that’s a lot of savings! To help your plants retain moisture for a longer time period, make sure to spread a layer of mulch over the soil. For outdoor plants, Back to Eden is a great gardening method for aiding water conservation. 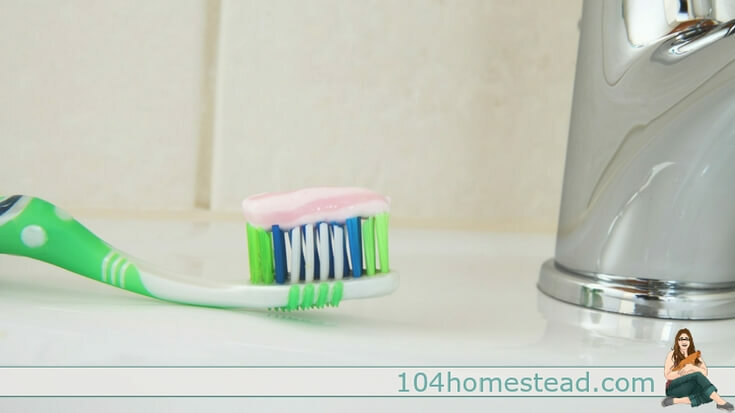 Cleanliness is important, but we waste a lot of water on our hygienic routines. The good news is that we can stay squeaky clean and save water at the same time — all it takes is a change of habit. If you keep your shower under 5 minutes, you’ll save up to 1,000 gallons per month. Try a military shower! Shut the water off while you soap up — you’ll save about two-thirds the amount of water you normally use. Plug the bathtub before turning on water for your bath. Adjust the temperature as the tub fills. Alternatively, skip the bath altogether. A five minute shower will use far less water. Turn the water off while you lather your hands, brush your teeth, and shave. Turn it back on to rinse. This is surprisingly huge when it comes to water conservation. Use your towels a couple of times before washing them. Don’t use your toilet as a trash can. Depending on the age of your toilet, you use up to 5 gallons of water every time you flush. If it can go in the trash can, put it there instead of flushing it. Washing dishes and clothes is a huge drain (no pun intended) on our water resources. Here are some water conservation tips for the kitchen and laundry room. Use fewer plates and cups to reduce the amount of water that needs to be used. Dishes don’t always need a full wash to be reused. A measuring cup used for water, a plate with only a few sandwich crumbs, a spoon used to stir tea — these can all be reused without rinsing. Scrubbing food encrusted dishes under running water is a waste. Soak them right after use for easy and waste-free cleanup. If you wash dishes by hand, don’t let the water run. Fill one basin with wash water and the other with rinse water. If you have a dishwasher, use that instead. Dishwashers typically use less water than washing dishes by hand. Don’t use the the garbage disposal if you don’t have to. Instead, compost food waste and use it in the garden. With laundry, skip the extra rinse cycle unless the load really needs it. If it does, try to group all the dirtiest things together into the same load. Whether it’s the dishwasher or the washing machine, make sure you’re only running full loads. Aerate your lawn with holes spaced every six inches. This will allow water to reach the roots, rather than run off the surface. Adjust your lawn mower to the height of 1.5 to 2 inches. The taller grass will shade roots and hold soil moisture better than short grass. Instead of tossing your lawn clippings, leave them on your grass as mulch. This cools the ground and holds in moisture. 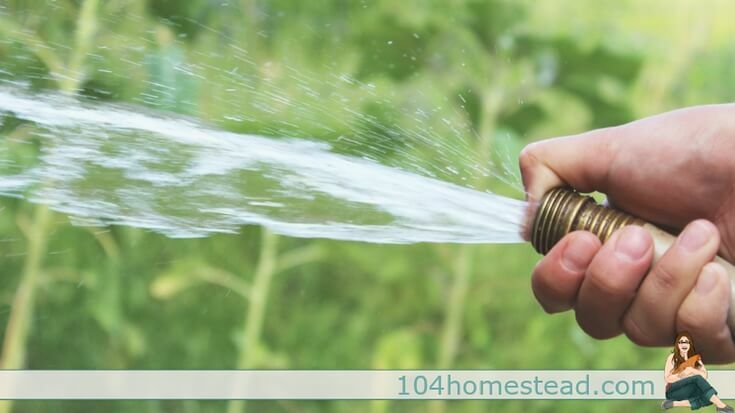 Water dry spots by hand instead of running the sprinkler system longer. If at all possible, consider replacing your lawn with an alternative. Xeriscaping has become popular not only for its water conservation, but for its beauty as well. When it comes to farming, irrigation is absolutely necessary. Luckily, it’s remarkably easy to conserve water while making sure your crops are getting exactly what they need. Install an irrigation timer with a rain sensor to avoid watering when it really isn’t needed. If you don’t have a sensor, keep an eye on the forecast so you can shut off your water accordingly. Use drip irrigation to deliver the accurate amount of water to trees, plants, flowers and shrubs. Since it soaks directly into the ground, there’s no waste due to blowing winds or runoff. Check sprinklers and irrigation lines frequently to ensure they haven’t broken and are not spraying a walkway or paved area. If you’re planning on getting new appliances and fixtures soon, go for something efficient. Faucet aerators, low-flow toilets, efficient dishwashers and washing machines — all can add up to big water savings. Last, but definitely not least, check for leaks regularly. Every faucet, every fixture, every pipe. One drip per minute is almost 53 gallons of water wasted per year. The quickest way to conserve water, is to make sure it’s not escaping unheeded. 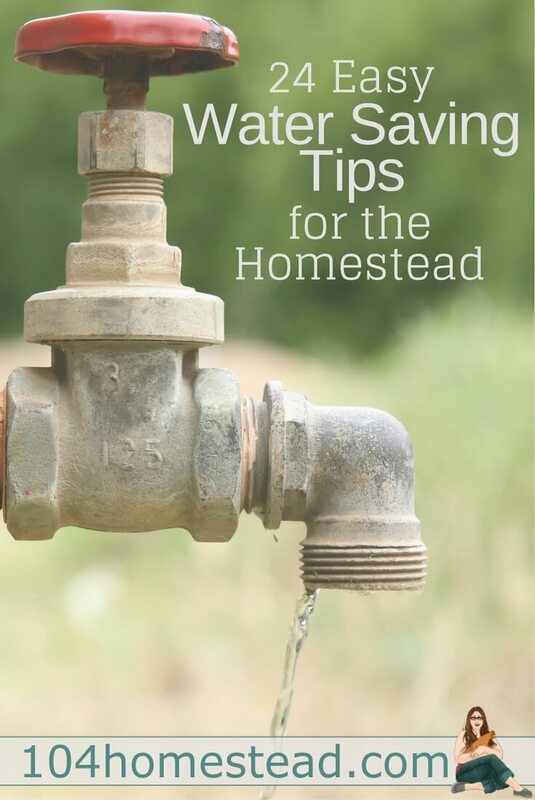 From the way you wash dishes, to the irrigation systems in your fields, you can do so much to save water on your homestead. Happy water conservation, friends! I save the water from the canner after I’m done preserving. Let it cool and use to water plants. Hi, Myself Sheela, I have gone through of all information about how to conserve the water in various places. So nice information have you provided. I also use much water saving methods like water saving shower head, water saving tap aerators, tap aerators for kitchen, bathrooms, garden, toilets. Hi, nice information about how to conserve the water. Very simple things have you noted above, people have wasted water for more hygiene in daily. Simple things, but too good for conserving the water. I can share information to reduce the water flow. Buy water saver adapters, water saving taps, water saving showers. 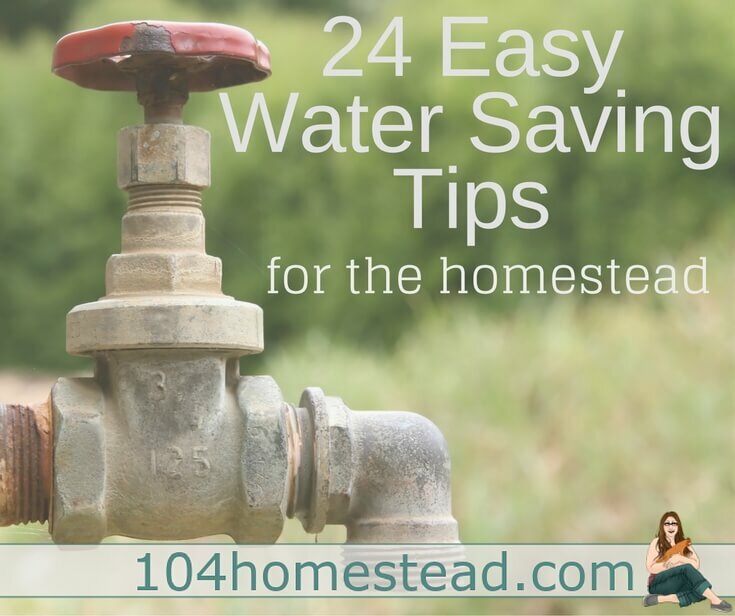 Use these water saving methodswater saving methods for reducing the water flow in the home. We can save the liters of water per year.